A few months ago I got a lovely email from a Stonesoup reader, a gentleman who had been living with cancer for a number of years. After telling me how much he was finding Stonesoup helpful for expanding his cooking skills, he had a request… would I read ‘Anti-cancer’ by David Servan-Schreiber and come up with some Stonesoup recipes to fit the recommendations in the book. It sounded interesting, so I ordered the book, not sure exactly what to expect. Can Your Diet and Lifestyle Influence Cancer? From the many examples in Servan-Schreiber’s book the answer would appear to be a resounding ‘YES’! One of the most interesting studies detailed in Anticancer concerned a group of men with early-stage prostate cancer who had elected not to undergo surgery at that stage. The group was randomly split in two. One group was monitored on a regular basis with no change to the diet, exercise and stress management practices of the participants. The other group followed a vegetarian diet with supplements (Vitamin C, Vitamin E, Selenium, Omega-3 Fatty Acids). They engaged in at least 30 minutes walking 6 times a week and stress management programs. Plus they attended a support group session each week with other participants. After 12 months, 6 people from the first group had their cancer worsen and had undergone surgery. Whereas in the lifestyle-change group, no one had required surgery. Not only that. Over 500 genes in the prostrates of the lifestyle-modified group had undergone functional changes. They showed increases in activity of genes that protect against cancer and a decrease in those that promote cancer development. So what we eat and how we move our bodies CAN make a difference to our ability to fight cancer. Exciting stuff! For more details, I highly recommend picking up a copy of Anticancer. In the mean time, to get you started, here are 15 anti-cancer foods highlighted in the book, including links to Stonesoup recipes that feature these foods. You’re probably already aware that green tea is a wonderful source of anti-oxidants but did you know that white teas contain even higher levels? I’m already a big white tea fan but after reading Anticancer was considering switching to green tea. Until I did a little research of my own. I hadn’t ever thought to use tea in cooking until reading this book. So if you’re not a fan of tea, or even if you are, consider adding it to soups or stews instead of other liquids. Try the anti-cancer mushroom soup below to get you started. Both olives and cold-pressed extra virgin olive oil are naturally high in antioxidants. Drizzling olive oil to add richness to dishes is an easy way to include more olio. My other biggest source is in dressings for salads. Turmeric is a super powerful anti-inflammatory and has been shown to decrease tumour growth in lab tests. It needs to be eaten with black pepper to maximise the goodness and preferably dissolved in a little oil. :: add 2 teaspoons turmeric to this red curry soup. Another powerful antioxidant. My Irishman loves sliced of fresh ginger in his tea, with a little honey. Or add some finely sliced ginger to stir frys. This covers some of my all time favourite veg: cabbage, brussels sprouts, cauliflower, broccoli, bok choy and chinese cabbage. All contain powerful anticancer molecules, although it should be noted that boiling veg reduces the concentration of these. The alliaceous family not only helps promote the death of certain cancer cells, it also helps to regulate blood sugar levels. The active components in garlic are easier to utilise if dissolved in a little olive oil. Includes all red, yellow and orange fruit and veg. Examples include sweet potato, pumpkin, carrots, red capsicum (peppers), tomatoes (especially tomato sauce or puree), beets, apricots. Soy tends to be controversial but Servan-Schreiber gives non-GMO soy the thumbs up from an anti-cancer perspective. 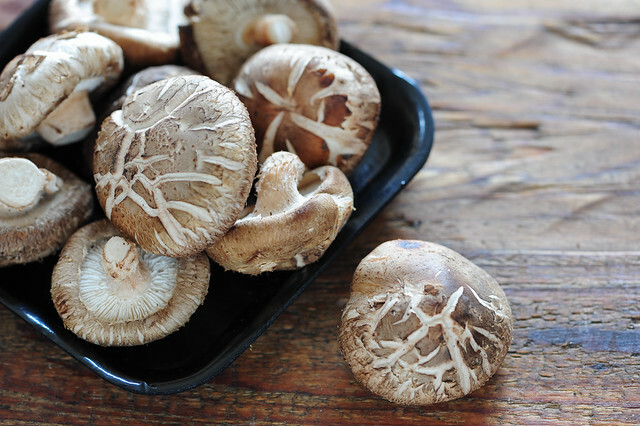 Mushrooms contain chemicals which stimulate the immune system. And they’re also super delicious! Don’t forget the mushroom soup below. Herbs contain chemicals which help to block the spread of cancer cells. It’s easy to include a little parsley, mint, basil, rosemary or thyme in most dishes. As a rule of thumb woody herbs like rosemary and thyme are best added at the beginning of cooking and leafy herbs best added at the end. These friendly bacteria help with digestion and support the immune system. Dark chocolate contains antioxidants and other compounds which help slow the growth of cancer cells. So a little dark chocolate is a good thing, but aparently the milk solids in milk chocolate cancels out the benefits. So stick to 70% cocoa solids or higher. Both berries and stone fruit, especially plums contain high levels of anticancer molecules. Freezing doesn’t damage the molecules, so frozen fruit is fine. Citrus fruit contain anti-inflammatory molecules and help the liver eliminate carcinogens. The zest appears to contain the highest concentrations of these molecules. :: preserved lemons – includes ideas for using preserved lemons as well. As a former wine maker, this is one of my favourite inclusions! Although it should be noted that more than one glass a day may lead to an increase in cancer. If you’re looking for tips on cooking with wine, I recommend reading wine week: 7 tips for cooking with vino. All the ingredients in this soup come from the anti-cancer food groups listed above. To boost the anti-cancer nature of the soup even further, consider adding in some thyme leaves or a little turmeric or curry powder. I’m doing well with my goal to expand the soup recipe collection here on Stonesoup. I just adore mushrooms especially when they’re in soup! Feel free to play around with different types of mushrooms. I used a mixture of field mushrooms and shiitake this time. Wild and cultivated work equally well here. 1. Heat a generous glug of olive oil in a medium saucepan. Cook onion, covered for about 10 minutes or until soft. Stir every now and then. 2. Add garlic and mushrooms and stir fry for a few minutes. Add tea or water and bring to the boil. Simmer, uncovered for 10 minutes or until the mushrooms are tender. 4. Puree soup using a stick blender, leaving some chunks or however you like. Taste. Season serve with yoghurt on top. dairy-free – skip the yoghurt and serve with a good drizzle of peppery extra virgin olive oil. caffeine-free – use a caffeine-free tea or take the water option. creamy soup – fans of creamy soups can stir in a few tablespoons of double cream after pureeing. mushroom ragu – replace half the green tea with a can of tomatoes. Simmer until thickened and skip the pureeing step. ps. Looking for more Healthy recipes? Glad to hear you’re ahead of the game Jade! I love the car analogy Sarah! Try it with fresh turmeric — it’s even more alive! Thanks for the reminder about turmeric tea.. I’ve heard of it but haven’t ever tried..
Great article. It’s beneficial to spread this type of accurate information. Eating well and exercising regularly are practically foolproof ways to increase wellness. I was surprised that soy was recommended in the book.. interesting to hear that you’ve but it out. Brilliant post! Just chock-full of information and links to your recipes. Thank you! Thank you so much for a great article the reinforces the importance of food for our wellness! I think it’s so wise to look to what we are eating for our health and to instill those values early on with our children. I’m excited to incorporate some of these foods and recipes with the little ones I teach! I really like your blog, but I feel like you’re a little out of your area of expertise here. Yes diet and cancer are related, but citing a random book with lists of antioxidant rich foods isn’t the same as real scientific evidence for cancer prevention. Biology is very complicated, and it’s important to be rigorous in how we discuss food and health benefits. You’re right biology is complicated! But we don’t all need to understand the mechanism to benefit from sharing knowledge such as this. My aim was to give my readers another reason to eat more vegetables! If you’re looking for the science behind the recommendations, you’ll find the studies well documented with references in the book. Jules, I`m from Brazil and I always read your blog. I liked very much this post because I love mushrooms and discovered I eat many anti cancer foods! Congratulations for your blog and thank you for share interesting informations! Love this post, Jul! Really interesting to read about. I think anything that is within our control to prevent cancer is a plus so why not eat as many anti-cancer foods and this mushroom soup sounds delicious with this wintery weather. LOVE the first pic of the mushies, too!!! How very interesting. The lists from the book look healthy and include lots of foods we incorporate in our diet. We recently have cut out sugar and flour for awhile and it has forced us to eat so many more vegetables. I love mushroom soup and am always looking for various options. Your soup looks delicious. Good for you cutting out sugar and flour and eating more veg! The book AntiCancer-A New Way of Life, was recommended to me, two weeks ago when my husband was diagnosed with Lung Cancer. At the saddest and most helpless period of our lives, this book put things in a different perspective. We have hope and in addition to modern medicine, good food can give us a fighting chance to survive a horrible cancer. It certainly can’t hurt. I have read Tastespotting for several years now, but haven’t checked in for a couple weeks since my husband got sick. Imagine my surprise to find your post about AntiCancer foods…..! Thank you for posting this. Excellent article, thanks! I’m just starting the Eat To Live diet (from Dr. Joel Fuhrman’s book, Eat to Live) and it mentions many of the same benefits from these foods. He is a huge proponent of eating BOM (berries, onions, mushrooms) and a mostly vegan diet. The BOM are anti-angiogenic, which means they starve fat cells of blood supply. Research shows that cancer cells are also known to hijack angiogenesis and keep it permanently switched on to ensure that it has a dedicated, uninterrupted blood supply so it can grow. It seems that eating foods that can block the process of angiogenesis, you can starve these cancer cells. Either way, even if it’s all bunk, you can’t hurt your body by including all of these awesome nutritionally dense foods in your diet! 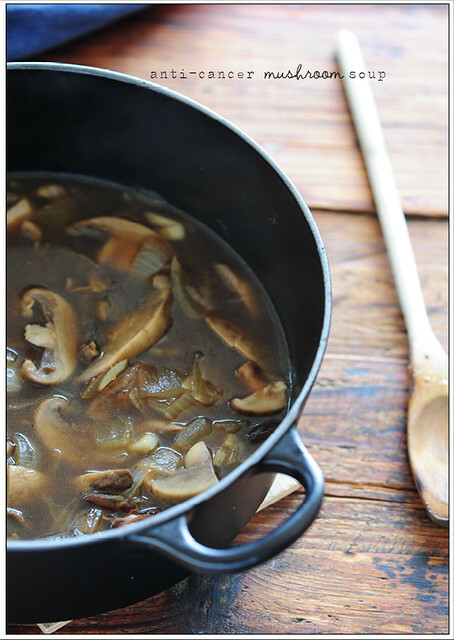 Thank you, Jules, for the awesome mushroom soup recipe — I’m going to try it today! I’m sure it will be fabulous as all of your recipes are! He doesnt mean eating the berries onions and mushrooms together does he? i’ve been on a soup kick since getting a new blender a month ago and have been searching for simple recipes online. i made this soup for dinner tonight and think it’s delicious! i used shiitake mushrooms, like you, since they’re one of my favorite types. love your simple 5 ingredient recipes! hope to see you add more soups! Soy isn’t recommended if you have an estrogen based cancer like certain breast cancers…just a friendly FYI. I LOVE your blog! I just made the grocery list for the next weeks worth of meals. Thank you! So glad you like it Heather! I plan on trying this because I’ve had 2 different cancers in 2 different areas of my body and I thought this recipe might help to fight against getting it again. Let me be clear. My wife was a vegetarian & vegan for 25 years. She watched her health went to hemotology experts in Berkley,CA, but did not believe in medical doctors. Guess what, she died at the age of 63 from CANCER. DO NOT think you can beat Cancer just by eating certain foods. Get regular checkups at REAL doctors.